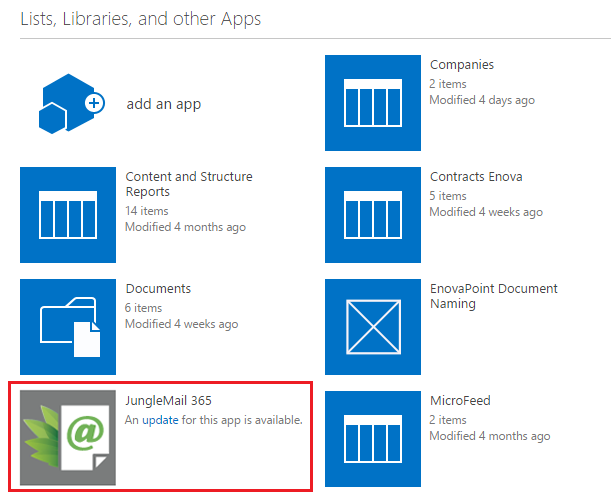 When a new version of JungleMail for Office 365 is released you can easily update the app. We will notify you via email once a new version is available. You can also check our website for the newest version. In this tutorial, you will learn about updating JungleMail for Office 365 to the latest available version. There are two ways in which you can update JungleMail for Office 365. You can either update the app from your Site Contents or via Microsoft AppSource. Navigate to the site where JungleMail for Office 365 is installed and select Site Contents from the drop-down menu in the top right corner. Here you will find JungleMail app. If an update is available it will say here. Select Update to install the new version of the app. Alternatively, you can update the app via the Microsoft AppSource. Search for JungleMail and click the Get it button; this will start the download of the latest version of JungleMail for 365.